A new scale chart featuring some of the most prominent members of Dromaeosauridae. I saw this on Wikipedia. 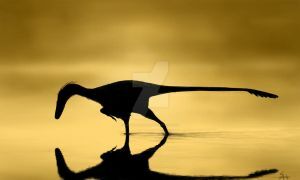 Look up Microraptor, Dromaeosaurus, Austroraptor, Velociraptor, Utahraptor or Deinonychus and you'll see it. I remember seeing this on Vsauce. Congratulations! You said that as if they asked for my permission or something ( no one ever does) but thanks, I guess. I mean, you released it under creative commons, so they can use it. Anyway, awesome drawing! I didn't know about microraptors until now, they are adorable. Saw this on the latest Vsauce vid! Is the coloration hypothetical, esp. 3? Yeah, all of the color schemes are hypotethical. We don't know the coloration of these species yet. Cool! What are those two smaller ones on the ground? Dromaeosaurus and Velociraptor- their reference number are above each animal, but I guess they're a bit hard to see. This is great for all sorts of reasons. It makes me wonder just how big natural history's largest feather could have been. I would think probably those of Deinocheirus would be the biggest. Ornithomimus is thought to have had large display feathers on its arms and if Deinocheirus had the same, those would be massive. Nice. Looking at this, Deininychus wasn't really that big was it? If there's 1 thing I like about your drawings, its the creative colorations. In this case, it's especially true for your Austroraptor & Utahraptor. I also like the top hat guy. My only problem w/this drawing is the Velociraptor (Something looks off about its wings), but that's just a nitpick. The Velo wings are driving me crazy, already updated them twice but can´t make them work the way I want. I probably should just start from scratch with a pure profile picture. Thanks for the compliments. I was about to stick to my old Utahraptor colors but this somehow seems more realistic, yet less striking. Ah, amazing! Love the new colors for the deinonych. Thanks man. Yes, the old one colors looked too much like Velociraptors, also not a big fan of crests on dromies, but I wanted to show some diversity here. What ho! Given their apparent intelligence and ornamentation, old bean, I would declare that dromaeosaurs were probably the dapper gents of the Cretaceous. Spot of tea? Quite so! I agree, ol' chap. really good, i especially like the Deinonychus. Wow. why do I have the feeling that in ALL books I've ever had about dinosaurs, they always exchanged the sizes of deinonychus and dromaeosaurus? Really? in my books Deinonychus is always featured as the bigger one, and trust me, I have pretty some pretty bad dino books. But the dromaeosaurus is the one at the left, check the description. Ah, no problem. Maybe I should put numbers on the animals to avoid misunderstandings. Impressive creatures but I have to admit I am glad they are not living in the present time. Drawing their feathered bodies surely was a bunch of work but it looks very good (my fav is Utahrapotor because its dots remind me of a fawn). Ah, I don´t think the little ones would be a bigger threat than coyotes or pumas. I would stay the hell away from the others, though. Glad you like it! Love the colors on the Utahraptor! I'm thinking of doing a spinosaur group drawing when I get finished with their singular drawings. I'm not the only one who likes that general color of feathers on Utahraptor. Great scale! This really shows how small Deinonychus was. It was no where near the size of the raptors in JP, which they claim was Deinonychus. I think the length was very similar but the "raptors " were waaay taller due to the longer legs. Sorry for deleting this from my messages; it was an accident. Thanks! I changed the Deinonychus a bit inspired by your eagle-like Utahraptor (hope you don´t mind), but I´m still not satisfied, still looks sort of bland. No, that's fine! It does still look a bit bland compared to the others and the Velociraptor's primaries still bother me. But neither is a huge issue, nor do they spoil the piece.